Zulfirman Rahyantel is a student at Pattimura University, Ambon, a city that has experienced 10 years of inter-religious violence. Zulfirman has initiated much-needed discussions about issues involving grief, resentment and hatred. He has organized community dialogues to encourage mutual respect, open mindedness, and a safe space to communicate. He was a facilitator for Indonesia Non Violence Study Circles Network (INVSCN). He is junior technical advisor of youth leadership program in Inspiring Development Institute. 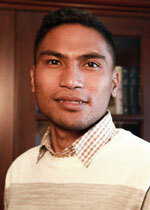 He is an active member of several influential youth and student organizations.